Salt Lake City, Utah, February 2, 2010 – Uinta-Wasatch-Cache National Forest officials would like to remind all winter recreationists to have a safe, fun-filled season and to be extra careful while out in the woods. Snowmobilers, skiers, snowboarders, snowshoers, and dog sleds all share the same trails at some point in time, so it is extremely important that all users respect each others rights to enjoy their recreation activity of choice. Snowmobile users should always proper trail etiquette such as: Obey all trail signs. Slow down when meeting other users and oncoming snowmobile traffic. Pull to the right ride or just off the trail if you meet oncoming dog sleds. Stop before crossing highways. Stay to the right on curves and slow down. Make sure your snowmobile is legally registered. Never snowmobile in wilderness areas. Make sure you are riding on trails, roads or areas that are open to snowmobiles. Maps are available to identify routes open to motorized and non-motorized uses. These routes do not include adjacent, surrounding lands or private property. Please leave gates open or closed, as you found them. Respect private property. You can pick up Winter Travel Maps at local Forest Service offices that will show you what trails, roads and areas are open for snowmobile use. 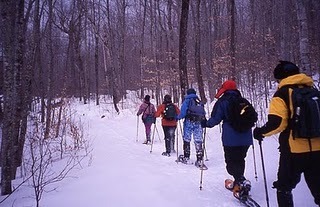 Skiers and snowshoers should always move to the side of the trail or just off the trail when you hear snowmobilers approaching. Please do not insist on the right-of-way, you are no match for a snowmobile. Remember you are responsible for your own safety. BE PREPARED FOR ANYTHING! Always stay alert on trails, know your limits for whatever form of winter recreation you choose to enjoy. Respect the rights of other users and the National Forest you are recreating on.